Fitment: Fits models with standard sliding or flip up sunroofs. Excludes models with "lift out" removable style sunroofs. 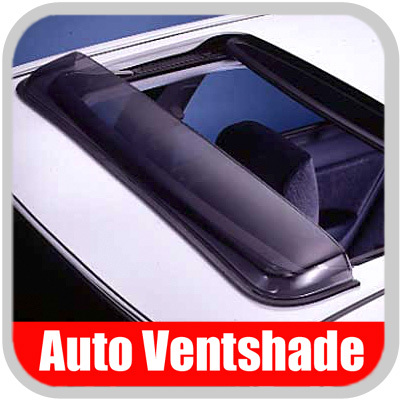 Prevent rain from entering your open sunroof with this AVS brand sunroof wind deflector and keep you and your passengers dry and happy. Installation is a snap as you simply peel off the backing material from the OEM-approved quality 3M acrylic tape, stick the wind deflector in place and you're finished! Minimize wind turbulence & wind noise with this new sunroof wind deflector by AVS to enhance you driving pleasure and comfort. This AVS brand sunroof wind deflector can help reduce interior heat build-up inside your vehicle to keep you cooler and extend the life of your vehicle interior components.